For as long as people have played and bet on sports, others have tried to fix the outcome. In America after the First World War the government closed racetracks, forcing gamblers to bet on baseball instead. The best team was the Chicago White Sox owned by Charles A. Comiskey. The Sox finished 1919 with a record of 88-52 and a batting team average of .287. Their opponents in the World Series were the Cincinnati Reds. The team from Ohio were the underdogs, with some bookies offering odds of 5-1 on them winning. It would take a complete Chicago collapse for Cincinnati to have any chance of victory. Anyone betting on that stood to win big. Chick Gandil was the Sox’s first baseman and he was friendly with Boston bookie Joseph “Sport” Sullivan. Three weeks before the series the two men met in a Boston hotel room where Gandil offered the services of several of his teammates in ‘throwing’ the series in return for $80,000. A few days later in a New York hotel room Gandil made the same deal with “Sleepy Bill” Burns, a retired pitcher turned oilman. Gandil recruited six colleagues but they lacked the financial clout to make a killing so they went to Arnold Rothstein (search the article) who paid the money and also put $270,00 on Cincinnati to win. The Sox traitors were Eddie Cicotte, Claude Williams, “Swede” Risberg, Fred McMullin, “Happy” Felsch, “Shoeless Joe” Jackson and “Buck” Weaver. The World Series opened on 1 October 1919 and Cicotte was paid $10,000 up front. Cincinnati Reds won 9-1 and on the second day they won 4-2 and became favourites to win but many became suspicious. The White Sox won the third match 3-0 but the Reds triumphed 2-0 in the fourth game .Game five resulted in a 5-0 win for Cincinnati but the Sox won the sixth and seventh matches to make the tally 4-3 with two games to play. Arnold Rothstein became nervous and insisted the fix was complete in game eight. 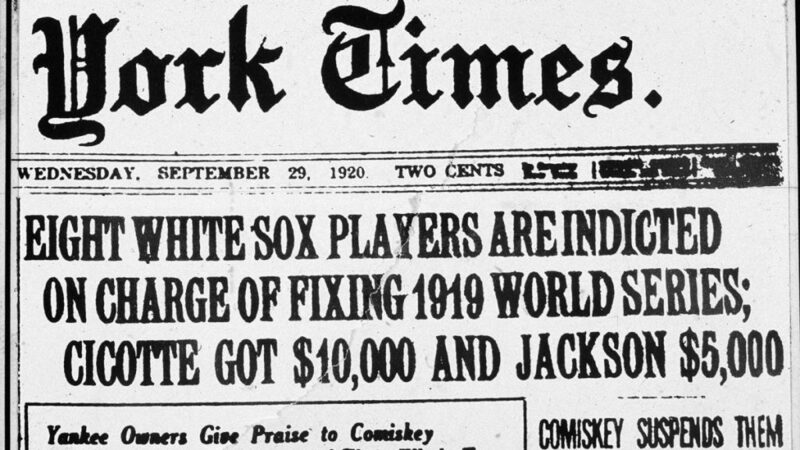 A Grand Jury investigated the series in September 1920 and Comiskey was forced to suspend the suspected players. At the trial in the summer of 1921 no one was convicted, although the players were later banned from baseball for life. As “Shoeless Joe” Jackson left court after the grand jury testimony a boy approached him and asked, “It ain’t true, is it Joe?” to which he received the rely, “I’m afraid it is.” When the encounter was reported in the press the boy apparently said, “Say it ain’t so, Joe”.